It’s a mighty sounding moniker, but the name “King’s County” also speaks to Brooklyn’s less-than-democratic origins. 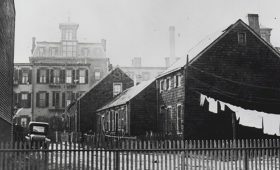 At the turn of the 19th century, the city of Brooklyn was known as the “slaveholding capital” of New York State and was home to the highest concentration of enslaved people north of the Mason-Dixon Line. But, after New York State abolished slavery in 1827, free black professionals bought land in what is now Crown Heights and founded Weeksville, a self-supporting community of African American Freedman, which grew to become the second-largest free black community in Antebellum America. By 1855, over 520 free African Americans lived in Weeksville, including some of the leading activists in the Abolitionist and Equal Suffrage movements. The new exhibition at the Brooklyn Historical Society, “The Business of Brooklyn,” celebrates the 100th anniversary of the Brooklyn Chamber of Commerce and tells the fascinating story of the borough’s 100 years of business, detailing its industrial past, large companies, as well as its preponderance of mom-and-pop shops. 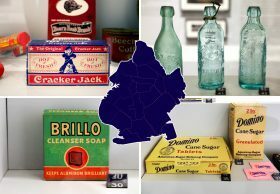 It also showcases many objects and artifacts, which have their origins in Brooklyn, demonstrating the significant “role that Brooklyn has played in American consumer culture.” The exhibition is on view at the Brooklyn Historical Society’s landmark building in Brooklyn Heights located at 128 Pierrepont Street until Winter 2019. From those iconic yellow pencils to Brillo pads to Cracker Jack, you may be surprised to see what has been made in Brooklyn. 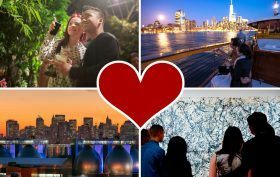 Roses and chocolate are nice, but why go the traditional route when the city has so much more to offer for Valentine’s Day. Show your significant other, spouse, or best friend how much they mean to you with one of these ten alternative events that 6sqft rounded up throughout the city. From a wastewater treatment plant tour, to after-hours museum visits, to a romantic evening at the planetarium, these are the perfect ideas for urbanists, historians, and art lovers.